Republicans spent the entirety of President Obama’s two terms in office painting him as some sort of boogeyman, a communist, terrorist sympathizer who was not born in the United States. They spent 7 years demonizing the Affordable Care Act and appealed to their base and even many moderates in making the case that the legislation was a slippery slope to communism, the end of capitalism as we know it, and a path to the mass confiscation of their guns. Their base bough it hook, line and sinker, as did enough moderates (mostly non-college educated, white men) all too eager to be frightened by the nation’s first black president named Barack Hussein Obama and successfully gave republicans control of both chambers of congress. They voted to repeal Obama Care 50 times throughout the terms of Barack Obama’s presidency knowing full well that the president would veto each vote. They did it for political grandstanding as more as a measure to pander to their base and whip up contrived anger against the bill to gain political points. 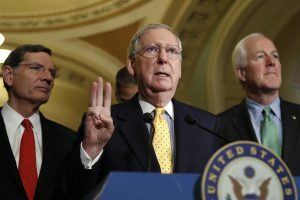 It may have worked in the short term, but in the long term, they never really had a cohesive plan to repeal Obama Care as evidenced by the House’s difficulty in passing their version of repeal and replace; while the senate has tried three times and failed. So what is the republican party left to do now? 1.) The senate GOP could go back to the drawing board and try again. This of course risks yet another failure and jeopardizes the remainder of their agenda with mid-term elections looming ever closer. 2.) Let Obama Care fail as their president suggested. This will link them with the callousness of their president who continues to set record low approval ratings (and will continue to do so for the foreseeable future) and give democrats ammunition that like their president, republicans would rather see people’s health suffer and even die in many cases rather than reach across the isle and work with democrats to enact fixes to problems of the ACA (which incidentally has gained record high approval ratings once the reality set in among the American people that it may well be taken away). 3.) Work with the democrats to make fixes to the ACA to make it better. Many do not recall the history of Medicare that republicans were once fiercely opposed to, yet given its popularity, have worked with democrats repeatedly since its inception to make fixes to the program to make it better. In a political climate that has grown so partisan that Americans detest congress for its lack of getting anything meaningful accomplishment due to stubborn partisan gridlock, this may help the republicans political cause by reaching across the isle and addressing the challenges of the current state of the ACA. The big wildcard in option 3 of course, is their president. Trump does not like to lose and the big question remains, if his party managed to pull off a bipartisan agreement to improve Obama Care would he sign it or veto it? One would have to bet that with the support of his leaders in both houses of congress, he would not risk the political fall out of vetoing a bill that his own party had a big hand in passing. However, public and political pressure has not phased Trump one iota with his decisions and much criticized Twitter rants. After all, in his mind he won an election that every poll had him predicted to lose; thus any negative press about him or his family must be the product of the “fake news media.” His base has steadfastly stuck with him up until now to the extent that he continues to feel invincible…such a man may just veto a bill that his own party crafted with the help of democrats. Next story Is There A Silver Lining To American Citizens’ Lack Of Trust In The Trump White House?